Providing adequate computing education to students can inspire them to choose computer science majors and careers, but not all states allow computer science to count as a math or science graduation requirement. #CSEdWeek represents an opportunity to offer informal experiences, and each of us can get involved. 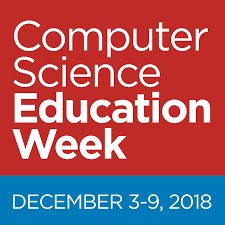 On Wednesday, December 5, 2018 at 5:00 p.m. MST, NCWIT will co-host and participate in a “Showcasing & Encouraging Equity During CSEdWeek” Twitter chat with Expanding Computing Education Pathways (ECEP) and National Girls Collaborative Project (NGCP). On Thursday, December 6, 2018 at 1:00 p.m. PST, NCWIT Research Scientist JeffriAnne Wilder will lead a webinar, hosted by National Girls Collaborative Project (NGCP): “Bridging the ‘Encouragement Gap’ in STEM +C.” // Register here. Introduce relatable role models. One of the most important characteristics of a role model is that students perceive them as “relatable” and similar to themselves. For this reason, NCWIT provides campaigns that profile and celebrate diverse technical women, such as TECHNOLOchicas. Co-produced with the Televisa Foundation, this campaign highlights the powerful stories of technical Latinas from various backgrounds and environments. Next week, TECHNOLOchicas will be out in their communities, engaging young Latinas and their families in interactive computing activities and Q&As with computing students and professionals. Follow along via social media (Facebook, Twitter, and Instagram) for a peek into all of the action. Get real. Appeal to students’ desires to solve real-life problems that draw on their existing knowledge and interests and that involve collaboration in hands-on technical projects. From LEGOS® to Scratch, view Promising Practices for introducing computing in an engaging way. Interrupt bias. Imagine this: in the capstone course, a student group decides to “divide and conquer.” They suggest that the lone woman in the group take the role of communicating with the client. What (if anything) would you do or say? Interrupting Bias in Academic Settings can help you practice ways to interrupt bias in real-life situations. Recognize the tricky (and necessary) business of male advocacy. Since diversity and inclusivity are business issues that impact all of us, we should all come together to work on them. Use the NCWIT Male Allies and Advocates Toolkit to better understand why male or “majority-group” allies are key for successful reform and to identify actions that male allies (or anyone really) can take to accelerate change efforts. Be an effective sponsor. Sponsors can make a world of difference in anyone’s career, but research shows that they can be especially important for female or other employees who are a minority in a majority-group environment. The NCWIT Sponsorship Toolkit outlines 10 ways to identify potential protégés and help them to advance.